The highly concentrated vendor landscape of the global market for phosphoric acid saw the leading 10 companies collectively accounting for far less than 50% of the overall market in terms of production capacity, hinting at an intense level of competition. Most of these companies are forward integrated to command a larger control over their distributers and suppliers and contain the price of their products to reach out to a large consumer base, observes Transparency Market Research in a recent report. Some of the leading companies in the market are J.R. Simplot Company, Yara International, Israel Chemicals Ltd., The Mosaic Company, Eurochem Group AG, Nutrien Ltd., Prayon S.A., OCP Group, CECA (Arkema Group), WengFu Group, Solvay, and Maaden. 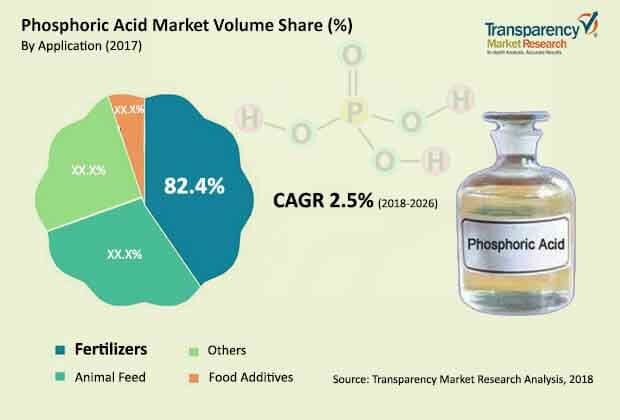 According to the report, the global phosphoric acid market will exhibit a 3.0% CAGR over the period between 2018 and 2026, rising from US$13,399.62 mn in 2017 to a revenue opportunity of US$17,399.93 mn by 2026. Of the key applications of phosphoric acid, the usage of the chemical in fertilizers accounts for the dominant share in the overall market. Geographically, the market in Asia Pacific accounted for a massive 58% of the overall market in 2017 and the regional market is likely to continue its bullish run in the global market over the forecast period as well. The high usage of phosphoric acid in the manufacture of phosphate fertilizers such as diammonium phosphate (DAP) continues to remain the leading growth driver of the global phosphoric acid market. With the massive surge in the global population and a notable decline in per capita farmlands, especially across emerging economies with rising rates of industrialization, fertilizers are being increasingly employed for compensating phosphorous deficiencies in the soil with the aim of increasing yield from each unit of arable land and improving the quality of the produce. Moreover, the rising demand for fruits, vegetables, grains, and pulses from the rising global population and the rising disposable incomes of the global consumer are promoting the growth of the global phosphoric acid market. Over the years, researchers have investigated the negative impact of phosphates and phosphoric acid on the environment, the health of the soil, and the water ecosystem surrounding areas that heavily contain phosphates. Rising awareness regarding the several drawbacks of the excessive use of phosphoric acid in the past few years has led to the establishment of several regulations mandating the reduction in use of phosphates or other synthetic fertilizers. These mandates could work as a restraint for the global phosphoric acid market as fertilizers are the leading consumers of phosphoric acid. As the uptake of natural fertilizers increases amid these circumstances, the global consumption of phosphoric acid could see a setback, hampering the overall growth prospects of the global phosphoric acid market to a certain degree in the near future.